Cities defined by great public destinations are becoming ever more important in a competitive globalized economy. Examples can be seen everywhere, from the transformation of Bryant Park and Central Park in New York, to the emergence of Lower Downtown in Denver and the revival of once-overlooked cities such as Barcelona, Copenhagen and Melbourne. 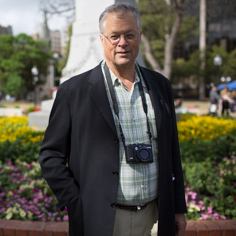 Based on more than 30 years of work at Project for Public Spaces, the non-profit organization I founded after working with Holly Whyte, I am convinced that place-based initiatives are the best way to promote vitality and prosperity in cities everywhere. Our experience helping people in more than 2500 towns around the world improve their communities shows that mobilizing people to make great places strengthens neighborhoods, cities and entire metropolitan areas. Nearly every city today can brag about at least one success story where determined citizens, guided by the idea we call Placemaking, made a difference in the place they call home. Even downtown Detroit now enjoys a popular town square—Campus Martius— whicnh has brought thousands of jobs and hundreds of millions of dollars in new investment to the hard-hit city center. These remarkable turn-around stories did not happen through the grand visions of designers, but rather by the creativity of a diverse group of people who thought imaginatively and applied broad skills to transform their communities into great places. But the recent trend toward “iconic” architecture—which has gained a big following in the media and among high-profile clients, winning numerous architectural prizes—minimizes the importance of citizen input and dismisses the goals of creating great public places. Instead it promotes a design-centric philosophy where all that matters is the artistic statement conceived by an internationally recognized celebrity. Frank Gehry, an architect of considerable talent and imagination, drew world attention to the iconic design movement with his famous Guggenheim Museum in Bilbao, Spain. In the process, he inaugurated an era in which designers call all the shots in creating our cityscapes, leaving us with showy buildings meant to be admired from a distance rather than contributing to the vitality of everyday life in a local community. 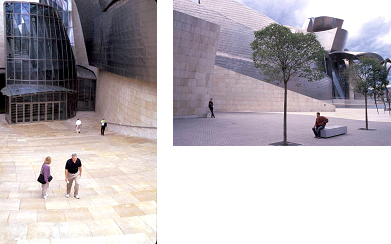 Gehry’s Bilbao Museum made a definitive design statement when it opened in 1997, putting this Spanish city on the map of contemporary cultural destinations. But this sort of media buzz enjoys a short life. To make an enduring impact, a place must continually reinvent itself to stay relevant to the times and its setting. The next step for this groundbreaking museum should be for it to evolve it into a great place that keeps people coming back for more than just architecture and art. It needs to become a spot where people naturally want to hang out in order to enjoy the entire experience and energy of an amazing city. 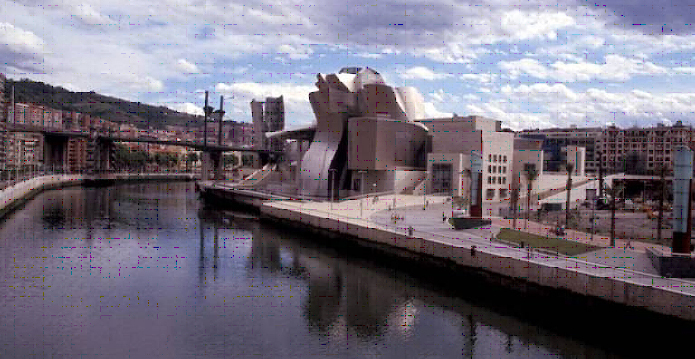 Our assessment is that the Bilbao museum does not do that. We have praise for the building as a work of art, but not as a destination. ‍The two people coming out of the stairs at the sunken entryway were mugged by the two people in the above photo and their camera was stolen. Muggings are common in the empty plazas. I am a big fan of some of Gehry’s buildings. I think the Pritzker Pavilion in Chicago’s Millennium Park is outstanding – a true iconic architectural achievement. The concert stage, the “Trellis” that spreads an excellent sound system across a large expanse of grass and the seating area are all awesome. I think it is his finest work. ‍The Pritzker Pavilion in Chicago’s Millenium Park, Frank Gehry’s finest building, fosters vibrant public life and contextually creates a real center for Millennium Park. Yet one of iconic architecture’s greatest strengths—the eye-catching quality of these new and sometimes beautiful buildings—also becomes its greatest weakness in the hands of designers, clients and architecture boosters solely interested in creating monuments with “curb appeal.” Too little thought is given on how to continue attracting people to these places after their first visit. Since many of these buildings are cultural institutions, whose success depends on instilling a sense of community and connection among their visitors, this is a particularly short-sighted strategy. One-time tourists won’t pay the bills of these expensive-to-maintain buildings. Cities as envisioned by iconic “starchitects” and their supporting cast of patrons and admiring journalists are worlds apart from the aspirations ordinary citizens have for their communities. That helps explain why designers today are deeply afraid of being judged by anyone other than their own kind. I was forcefully reminded of this at the Aspen Ideas Festival this summer when I asked Frank Gehry a respectful but direct question about why great iconic architecture rarely fosters great public spaces. He declined to answer the question, and waved his hand to dismiss me, a haughty display that eminent journalist James Fallows compared to Louis XIV. The session’s moderator Thomas Pritzker, chairman of the Pritzker Prize jury, also avoided the question. Their response (or lack, thereof) set off a furor in the design-world blogosphere. I believe this simple question ought to be asked of every designer and every client on every project: “What will we do to ensure that design creates good public spaces for people to use and enjoy?” For a designer to duck that question does a huge disservice to the profession and society as a whole. Good design involves much more than making “bold” and “innovative” aesthetic expressions; design should help us achieve solutions to the major urban issues confronting our world today, from environmental destruction to economic decline to social alienation. Architecture falls far short of its potential when designers focus all of their talent on what shapes and facades to use in making their latest artistic statement. Traveling around the world to work on public space projects, I’m always excited to see the latest trends in design. But I have to say that when I examine them in the context of their settings, they usually are failures. What looks sensational on the pages of an architectural magazine or website too often falls flat when experienced up close. The idea of great places as espoused by the iconic architecture movement is very different than that of almost everyone else. 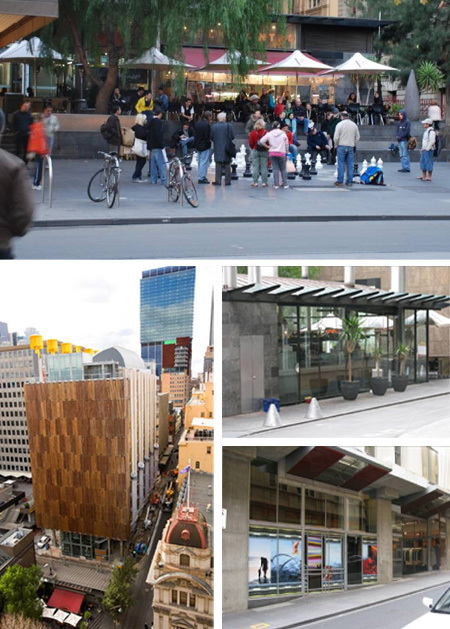 All of us at PPS are amazed when we ask stakeholders and residents in a given city to evaluate a public space or building that is highly praised in the media and among the design community. They are often ruthless in their assessment. Not impressed by design awards or lavish praise in architectural journals, local citizens are focused how well a space works for people. 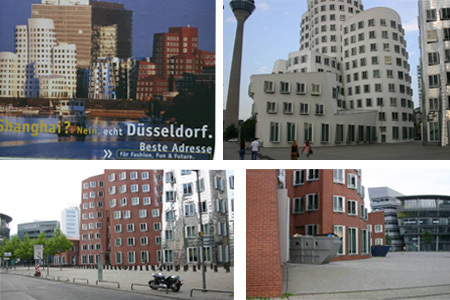 This raises issues about the elite nature of many of these iconic buildings—contemporary art museums, opera halls, university buildings etc.—that occupy prime settings in the heart of a community and are subsidized by public funding (if not in the actual construction, then in public infrastructure and upkeep for the surrounding area). There is a moral obligation that these landmarks serve a wider audience than just contemporary architecture buffs in order to justify the investment of public and tax-free charitable money that goes into them. The best way to do this is to create a convivial setting—outdoors as well as indoors-- that the whole community will see as an asset. This issue is being addressed in Perth, Australia, which has one of the most unique combinations of cultural institutions anywhere in the world. The State Library, a museum focusing on the natural history of Western Australia, the Art Gallery of Western Australia, the Perth Institute of Contemporary Arts and adjoining public spaces sit next to the central railway station and downtown, offering wonderful potential for a major destination in Perth that is more than the sum of its parts. However, until recently there has been little focus on nurturing the rich public life these cultural institutions could cultivate. PPS is working with the East Perth Redevelopment Authority (EPRA) on a short term physical improvement program and management strategy intended to enliven the Cultural Centre at all times of day and in all seasons. Our plan is to create a great place that offers people 100 reasons to visit, which will drive greater attendance to the cultural facilities. My question to both Gehry and Thomas Pritzker was a plea for help and a call for action. I was seeking their advice on how to assist the design professions in forging a place-based architecture that can address the enormous challenges facing us today. Creating “iconic for iconic sake” buildings is no longer enough—architects must become more inventive in creating new design strategies that can sustain the environment and improve daily life for the one-half of the world’s population that now live in cities. The current development slowdown caused by the real estate crash and global economic crisis gives us time to reflect and re-orient our focus. We can emerge from this slump armed with bold design innovations that will strengthen local communities and economies, protect the earth and establish a new kind of architecture rooted in a sense of place and a mission to improve people’s lives. It’s not clear yet what shape this “New Architecture of Place” might take, but we know that today’s current trends in design show little promise in addressing either the problems or opportunities confronting us today. The problem is not with the idea of iconic architecture, as some architectural traditionalists charge, but with the constricted approach that too many iconic designers embrace. Here are two recent examples of iconic projects that create a marvelous sense of place, thus treating the public to both cutting-edge design and a great destination to admire, use and enjoy. Purely Iconic in its design, the new opera house in Oslo, Norway by the Snohetta firm (based in both Oslo and New York) takes contemporary architecture beyond just the building to create an amazing public space where the public may literally use the entire site as a playground. In fact, Snohetta has explained that for this project, nature defines form and not function. The building itself is wonderful, featuring a dynamic design that allows for creative uses and opportunities for exploration. It is a masterpiece of form, function and nature, and thrives despite its isolation from the rest of the cityscape. To remain vital for the future, the building must grow into a larger mixed-use destination for year-around activity. 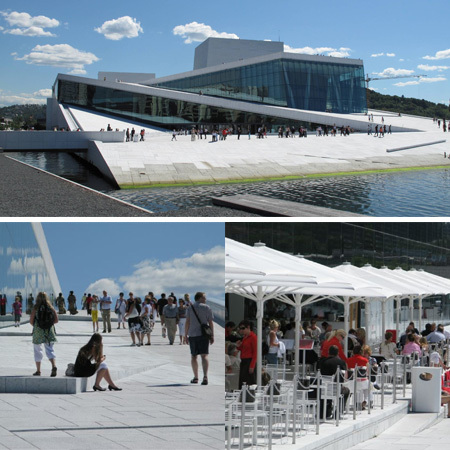 ‍Iconic Architecture at its Best: The Oslo Opera House attracts crowds of people despite an isolated location. Melbourne, a city that is reaching for the best in urbanism on many fronts, sports an impressive “green” municipal office building that richly enhances the surrounding neighborhood. This is a boldly beautiful accomplishment, which fosters street life and creates a good sense of place by connecting with what’s nearby. It has earned Australia’s six-star Green Star rating. 2. Going deeper, we need to establish an entirely new field that encompasses design but is not defined exclusively by it. This field would be wider than architecture, urban planning or community development, putting a special emphasis on the skills needed to work with communities in creating streets, community institutions and public spaces that improve people’s lives. Within this context, iconic architecture could be a very valuable asset but not the exclusive focus. How will it generate vibrant public life? How will it honor its context in the community? How will it delight people, bring them together and enhance their lives? The challenge in creating great cities for the future is enormous, yet critically important. Our attention needs to be focused on many levels of urban life: livability, local economies, community health, sustainability, civic engagement, and local self reliance. Good architecture and design, broadly defined, must be at the heart of all these efforts. When all of these goals are aligned, we’ll see a world-changing movement to repair the environment and improve living conditions for everyone living upon it.